Some pix of RMF that you can click, go to larger file sizes... for pitches, dartboard practice... purposes. The diversity of life has always fascinated me; but the systematics of mammals, birds, reptiles and amphibians was blown away by the expansiveness and degree of unknown of the fishes. Few people had "companion animals" overseas, but many friends had bowls and aquariums with goldfish, guppies and other tropicals. I was born in Rhode Island, the smallest State of the U.S. but grew up in the orient as my father was career military. We had very few jobs "on base" for the "dependents" but I was fortunate to secure employment at a fish store that was associated with a restaurant in downtown Sasebo. Other vainglorious work overseas includes two years working for a Betta culture business, collecting and processing marines in Manila.Back to the U.S. in the late sixties I stuck to the trade as a retail clerk, a livestock wholesale worker (for Pratt's in San Diego), and eventually formed an aquarium service business with a school friend. This business cycled larger and smaller, and supported me all through college and beyond. It eventually became an employee-owned corporation with aquaristic retail outlets, fabrication (principally large acrylic systems), water feature construction, manufacturing and distribution divisions. Subsequent to the tax law changes, water-shortage "scare", and general decline in the California and U.S. economy in the late eighties these businesses were sold and liquidated. I worked for three years as a consultant and buyer for the mass-merchandiser PetCo in their bid to upgrade their stores, incorporating livestock. Is there a difference between what you do for money and for a living? Not me. Nowadays I write articles and books for the diving/underwater natural history and ornamental aquatics interests, and manage my rentals and securities. I browse the electronic bulletin boards to "chat" with others daily, and often travel, to go "hashing" (sort of running), writing and photographing with friends around the world. Have been an avid hobbyist since first memories. Active in the local SDTFS from the sixties; helped in development of all three goldfish/koi clubs in San Diego. At times more active in scientific (AVMA, IAAAM, ASIH) and industry professional/business associations. Have many wonderful friends in the hobby, trade and science of aquatics, and dearly enjoy my involvement; it is my life's work and passion. A/The central thread to everything I have attempted in writing, presentation or action in the interest has been/is "to enhance peoples love of their own lives through an appreciation of the living world". I see the hobby/business evolving, much like and approaching western Europe, with a real interest in biotopes, the underlying science, understanding the technologies employed... This is an era of consumer awareness; there are less aquarists, but more conscientious ones that are becoming more aware and demanding value. I look forward to the availability of many more species of tank-raised marines, real aquatic plants, and ready, inexpensive access to useful information and graphics. As promised here is the draft text to use for future speaking engagements- can we put a button by the donate now, to say book Bob F now, and it links to this page? Dear Clubs, friends, and enthusiasts: First, thanks for being a fan of WWM, I started this site as a way to educate and share the love of fishes, and underwater natural history and love to share my experiences with groups, friends, and the general public. As you know I've been on all sides of the business and trade and site WWM is a forum for the joy of all of you. We get many request here for speaking at local events and we've developed this FAQ and for to help you booking us for your next special event. Who is this guy Bob Fenner anyway? I am happy come join you at your event but ask for the following agreement before accepting speaking engagements. How can I ask him to speak at our frag fest, club meet, Rotary or other special event? Is there a chance to have dinner with club members before and/or after the event? Is there is a opportunity drawing with the event, would your club like to use dinner with me as a fundraising opportunity to offset the cost? We understand that the donation may be difficult for small clubs, but do ask that you support our work at WWM. One idea would be to sell a opportunity drawing to have dinner with me while I am in town. I know this might seem like a strange question but I would be really interested to know what kind of aquarium you have personally? I could just imagine you having a massive state of the art aquarium full of rare and unusual fish! R: Heeeeeee! Oh Lori, I must admit, that with travelling such a great deal, I have but two Eheim units of approximately 80 gallons each'¦ that having aluminium tops are freshwater (! )'¦ I am an old re-hashed keeper of fancy goldfishes. As in: 'folks starting with goldfish and if they live long and well enough (going through cichlids, oddball freshwater, progressively or not about with general saltwater into specialty reefs) coming full-circle back to goldfish'. I do so enjoy my goldfish systems though, and they are very easy to care for in our part of S. California'¦ tipping out about 1/3 of their water weekly and replacing with straight mains water'¦ that is suitable hard and alkaline. Goldfish are easily fed via my Eheim auto-feeders, with Spectrum pelleted foods, along with the occasional Anacharis/Egeria pondweed plant for their nibbling'¦ And the 'Professionel' canister filters are an absolute dream to maintain'¦ being very dependable and quiet. Hello, this is Juan with the Marine Aquarium Society of Colorado again. We were hoping that you were still on board with helping us with the 2012 Science Fair competition? 1. There would be a 2 to 3 month period for people to submit to the judges what their experiment will be about. This will also include a detailed report about how they plan on researching and doing the experiment. 2. There would then be another 3 or 4 month period for them to actually get the experiment done. Hopefully in between all of this, the entrants would be updating their projects for the judges to comment on if they feel they should. With what Matt and yourself said last year we thought giving you, the judges, more time to evaluate each project would be best. Thus the first few months would be for the judges to help "coach" the entrants towards making their projects geared more towards what we all feel would be a sound scientific project. Speaking of judges we have added 3 new judges to help you and Matt out in this endeavor. Matt has agreed to continue helping, as well as adding the likes of Marc Levenson, Christine Williams, and Rich Ross. We are hoping that this round table of experts (including yourself) will help guide our entrants to put forward the best projects they can! The prize once again is a full fledged trip to MACNA as well as a few other items. Last years winner enjoyed his trip to MACNA BTW and wanted to thank you for your participation in helping with this event. His mother was so impressed that she will also be donating a scholarship to our winner this next year! Hopefully we can continue to have you on our team, and hopefully make this years event bigger than ever!! Bob, as you may or may not know I am the Vice President for the Marine Aquarium Society of Colorado. I was asked to contact you regarding something our club wants to do for our members. First off thank you for even considering the idea I am about to ask of you. The board of MASC is going to be holding an open to all members type of "science fair" where all of the members who decide to participate have the chance for MASC to buy them a round trip airline ticket to MACNA 2011. Now this of course wouldn't be until early next year, probably February'ish, but I wanted to reach out to you and see if you might be a "special judge??" The board of MASC would judge the projects at the event in which they are presented, and then the participants would post the "paper" they write and pictures of the project up on our website where you, and hopefully a few others chosen by us would be the final judges who would ultimately send this lucky reefer to MACNA. Please if you like the idea let me know, and if you have any suggestions I would also be open to hearing them. Again, thank you for even considering this and I hope to hear back from you soon. Hello, my name is Brandon Klaus. I am a 2008 marine biology graduate from Texas A&M University Galveston, a Marine Aquarium and Reef Society of Houston board member, and an avid saltwater hobbyist. I recently started my own blog (http://blog.aquanerd.com) and I try to add new content to the site daily. Most recently I did an email interview with Eric Borneman, with whom I have had the pleasure of meeting on a few occasions and have somewhat befriended. I would love to do a similar interview with Mr. Bob Fenner regarding the saltwater aquarium hobby if he is willing. I would whip up between 10 and 20 questions and have Mr. Fenner answer them at his convenience, then post it to the blog. aquarium communities out there. I am a huge fan of yours. I frequently venture onto wet web media to see what all is going on there and it's always full of great information. 1. first of all, what have you been up to lately? any new projects, presentations, etc? 2. how, why, and when did you get started in this hobby? 3. who (or what) has been your biggest inspiration? who has been your biggest supporter? 5. how many books/articles have you written, and which is your favorite or most helpful? 6. what topic do you just love to talk about, more than all others? 7. what is your absolute favorite fish, coral, or invertebrate? 9. what are your thoughts on aquarium filtration? like which one is your favorite/most effective? 10. what is your take on "trend" corals (like Acans or Zoas) that fetch hundreds of dollars per mouth/polyp/inch? 11. what has been your favorite and/or most useful piece of reefkeeping equipment? 12. where all do you or have you traveled, and what effect does this take on your personal aquariums? 13. when not living and breathing aquariums, what other hobbies or activities do you partake of? 14. what is a good/best source to learn about aquariums and corals? 15. what advice do you have for aspiring reef keepers? to get you back to Houston one day to talk about more stuff with my local club. best of luck with everything and thanks again. http://blog.aquanerd.com/2009/05/bob-fenner-interview_30.html . Tell me what you think about it and if you want anything changed. Thanks again for everything. Re: Speaker Blurb (for upcoming MACNA in Baltimore) <Man is this me? Can you come along next time I'm out begging at the banks? How 'bout St. Pete's gate? Bob "Glows in the dark" Fenner" Bob, Please look over and let me know James ---------- Robert M. Fenner "Sources of Mortality on the World's Reefs: How Important is the Aquarium Hobby?" Are collectors for the aquarium trade the "defilers of nature" and "raiders of the reef" that some critics claim? A former marine livestock collector, underwater photographer, and advocate of responsible aquarium keeping takes an objective--and introspective--look at the how the majority of aquatic life meets its fate in and out of the world's seas. What types and degrees of mortality are due to human activity, including ornamental aquatics? 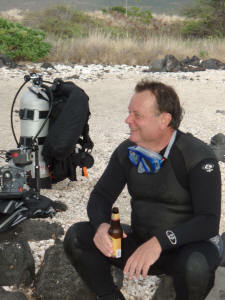 Bob Fenner is a marine biologist, former science teacher, and a leading proponent for the sustainable collection, sale, and keeping of reef organisms. His professional experience encompasses livestock collection, wholesaling, as well as aquatic retail, design, construction and maintenance as a manager, owner, hatchery worker, retail clerk, technician, and consultant. He is the author of The Conscientious Marine Aquarist (Microcosm). 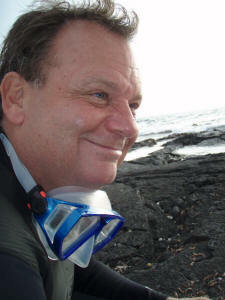 Bob lives in San Diego, California, and is active disseminating aquatic information via wetwebmedia.com. You would think that after nearly six decades in the fish hobby that I would be tough to stump, but that is hardly the case. The fortunate thing is that I have an ace in the hole. Living in the same town with me, even if he is half an hour away, is Robert M. Fenner. I can always call him in regard to aquaristic problems that have me stymied, and I have yet to stump him. That is partly understandable because Bob is a smart guy, and he has spent almost as much time in the aquarium hobby as I have. Since Bob is twenty years younger than me, he can't match me on time of experience, but his variety and full-time devotion to the aquarium trade has given him a most decided edge. Besides that, he has taught biology and even aquarium science at the college level. Perhaps it is not so surprising that he is a veritable cornucopia of information. The reader will understand better once I give the full range of his experience. Most hobbyists know of Bob from his book The Conscientious Marine Aquarist, a book that I consider a candidate for the best book on the marine hobby ever written. I am not alone in my praise for this book. It is typical Fenner, bristling with information in easy-to-understand terminology. While you may have read his fish books, one of them is of the type that you might not think would originate with him. That would be his book on sushi bar etiquette called, If you Knew Sushi like I Know Sushi. As it turns out, in addition to his other talents, Bob is an accomplished chef. I have noticed that whenever I visit the Fenner domicile, I not only learn about new developments in the aquarium field, I also get information about real estate or low-flush toilets. Burning with energy and enthusiasm, Bob has about fifty rental houses in the area, and he takes care of most of the maintenance himself. Although he has been married for ten years to the beautiful Diana Fenner, he takes care of the cooking and housework himself, enjoying his own vacuuming and yard work. When Bob does hire on help, though, he apparently goes first class, as the last time I was over there, the gardener had a law degree! A skilled fish and underwater photographer, Bob is almost as well known for his photographs as for his writing. And the man actually understands computers and all the peripherals that go with them! This is the type of thing that only teenagers and very young nerds are supposed to know! I stand in awe of his skill in this area alone--and I know where to go if my computer crashes! The source of some of Bob's skills will become apparent in the telling of his life story. Born in Rhode Island, Bob was the son of a career navy plumber. When he was eleven years old, his family moved to Japan for three years. While there, Bob got a job in a strange type of establishment that was sort of a combination restaurant and aquarium shop. Bob had already taken an interest in fish as practically a toddler when he acquired some guppies. He learned to accommodate his growing collection by use of the old time large-mouth pickle jars. Obviously, Bob gained some knowledge about cooking and fish keeping from the aforementioned establishment, but his first job at a bona fide fish shop assigned him to the duties of changing betta bowls. The crew mixed their own malachite green solutions for cleaning the bowls. One time they miscalculated and produced too strong a solution, whose residue killed all the bettas. But Bob learned from his mistakes and went on to jobs in fish shops and aquarium maintenance. During a stint in the Philippines, Bob worked for the famed fish exporter Earl Kennedy. Although primarily assigned to packaging and shipping, Bob also collected marine tropicals from the coral reefs. Having survived learning scuba diving, on his own, by trial and error, Bob later attained advanced certification at the YMCA scuba program. Because most of Bob's writings have been about marine life, few people are aware that he has equal enthusiasm for freshwater fish. He is quite familiar with all of them, of course, from his work, as well as his hobbyist interest in them. As a matter of fact, Bob was friends with cichlid maven Guy Jordan, one of my dearest friends. The 'sliding doors' phenomenon was still in effect, obviously. In any case, I am often astounded by his knowledge of relatively obscure freshwater fish. Fluent in Japanese, Bob seems to be quite at home with the scientific names, too. In fact, I am always about half a sentence behind with Bob because I spend half my time figuring out what organisms he is talking about. In my own defense, I would point out that most of us pronounce the scientific names differently. Hence, if the subjects are switching around, it is easy to get left behind a few steps. But I don't think that Bob ever gets behind when I am talking! Despite many offers and contemplated trips, we have not been diving yet together. That is my fault, as I am harder to get off the dime in regard to trips these days, but it is foolishness on my part, especially since our wives both enjoy diving, too. The next time a trip to the Red Sea is planned, I am going. After all, why shouldn't I make the most of the multi-talented Bob Fenner? Having him as our guide to the Red Sea would be almost as ostentatious as Bob's lawyer-gardener! Just a quick note for the guys & gals of WWM for my daily dose of education, Look forward to it everyday! If anyone is near the boss, please buy him a cold one for me.